The 2019 Elantra offers standout exterior styling, a refreshed interior and advanced technology. Elantra's available technologies help keep you safe and connected like the segment-exclusive Safe Exit Alarm, wireless smartphone charging pad and our BlueLink connected car system with remote start. Like Kona and Santa Fe before it, the Elantra now boasts the modernt styling, advanced technology and interior comfort that is becoming synonymous with the Hyundai lineup. Stay connected and enjoy every drive with the new 2019 Elantra. Forward Collision Assist with Pedestrian Detection, Safe Exit Assit, Blind Spot Alerts, Lane Departure Warnings, Driver Attention Warning, Rear Cross-Traffic Alerts and Adaptive Cruise Control, These are just a few of the advanced technologies Hyundai has developed for its vehicles in order to keep everyone safe on the road. Enjoy seamless connectivity with available Apple CarPlay and Android Auto. Interact with your favourite apps, access navigation, use voice command for text messages and more. There is also an available 8" touch-screen with built-in navigation, soyou don't have to access your celluar data when needing directions. It includes a complimentary Hyundai Map Care system, which includes two updates per year for five years, free of charge. Inside the spacious cabin, redesigned elements include the sporty checkered design in the gauge cluster and enhanced ergonomic layout of the centre console controls. Comforts offered to elevate your drive include an avilable 8-way power driver's seat with lumbar controls and standard heated front seats, a segment-exclusive feature we are proud to offer Canadians. Plus you can enjoy the comfort a heated steering wheel on Preferred, Luxury and Ultimate models. 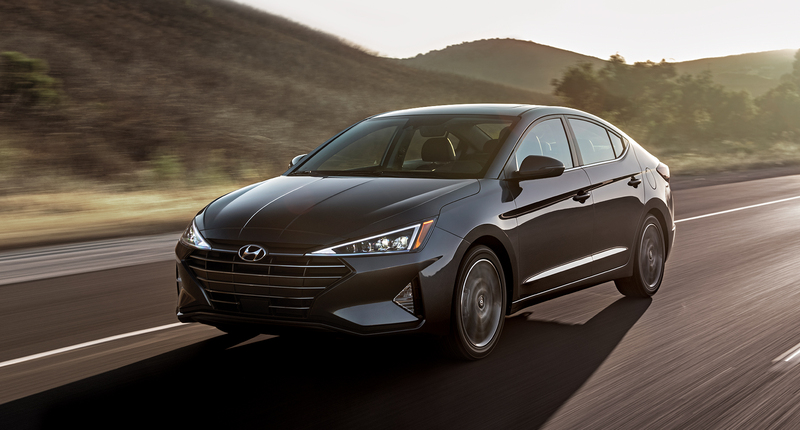 Powering the 2019 Elantra is a 2.0L engine delivering 147 horsepower which can be paired with a 6-speed manual or automatic transmission. The standard 6-speed manual transmission includes an EcoShift indicator that identifies ideal shifting points to help you save fuel, while the available 6-speed automoatic transmission features SHIFTRONIC manual shift mode for an engaging driving experience.